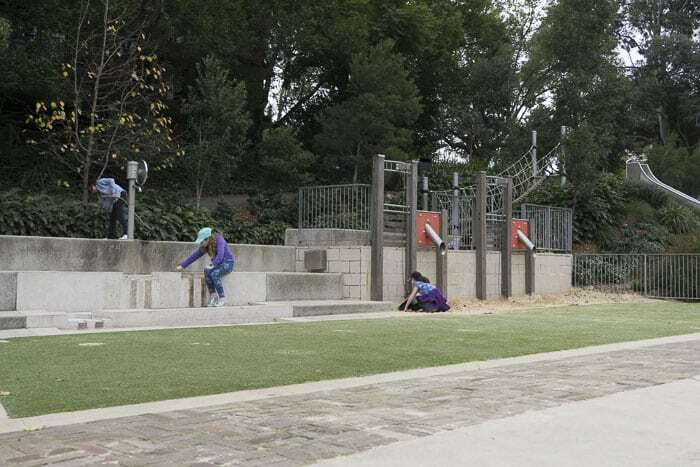 Parramatta River Foreshore Playground - A Winner! 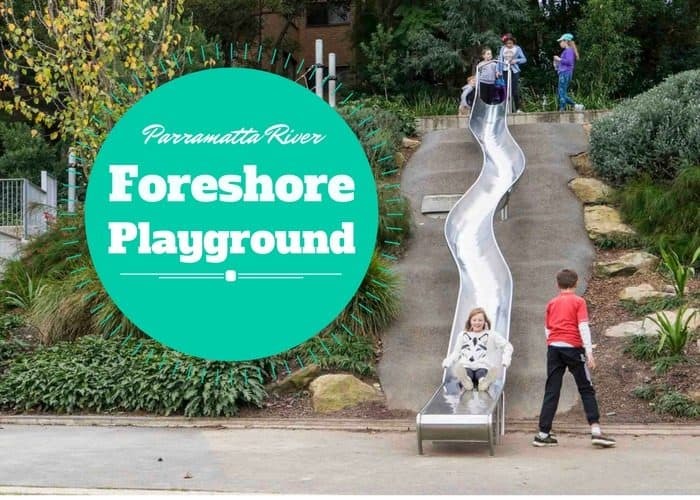 Who’s been to Parramatta River Foreshore Playground?? Quick, pack the kids and the car and get over there! 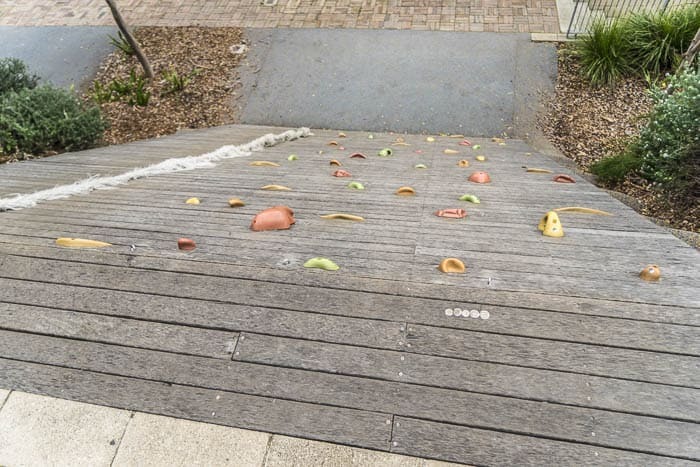 How much fun did my kids have on this scenic playground on the foreshore of the Parramatta River? We’d come by Rivercat from Circular Quay and the kids all needed to stretch their legs and have a play after the journey. And here’s a great spot for it. 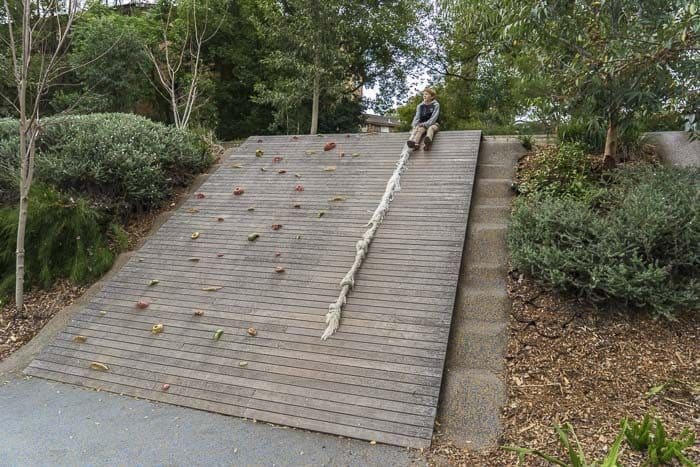 Build on a steep slope, this playground is terrific for teenagers, older children and bold younger ones. You need to keep a really close eye on toddlers and preschoolers as the river is so close and not fenced off. 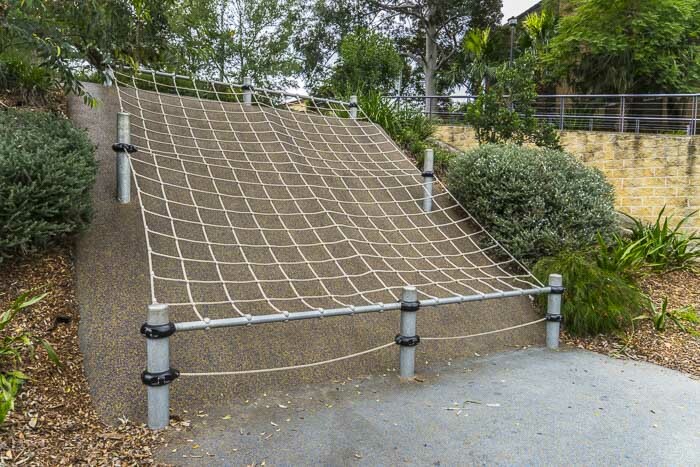 There’s a long and steep slide, a smaller slide, a climbing wall and a challenging steep rope net. 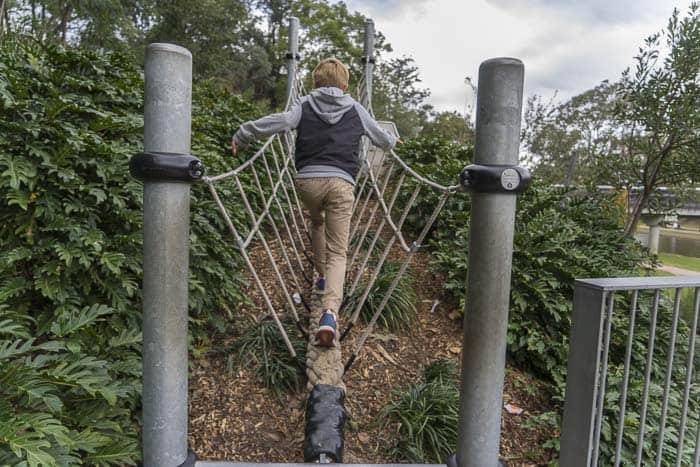 The rope bridge is pretty long and great for adults too – yes, I tried it all out. Love the slide. 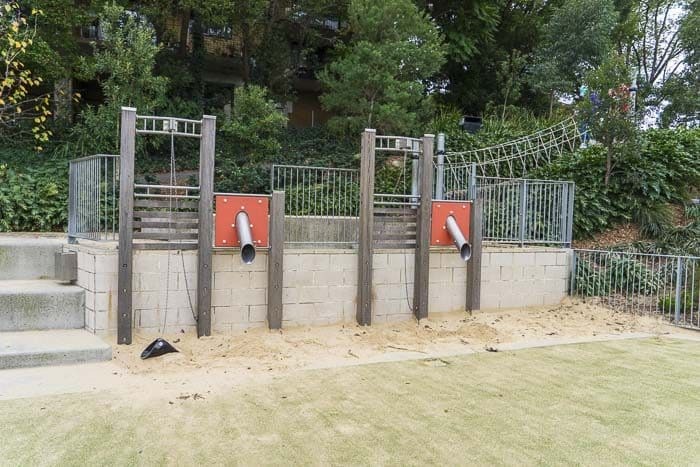 There’s a sand play area and water play space too. Nearest Coffee: The Port Bar is by the ferry terminal across the river and east a bit. Here’s 16 seconds of fun and games on video. 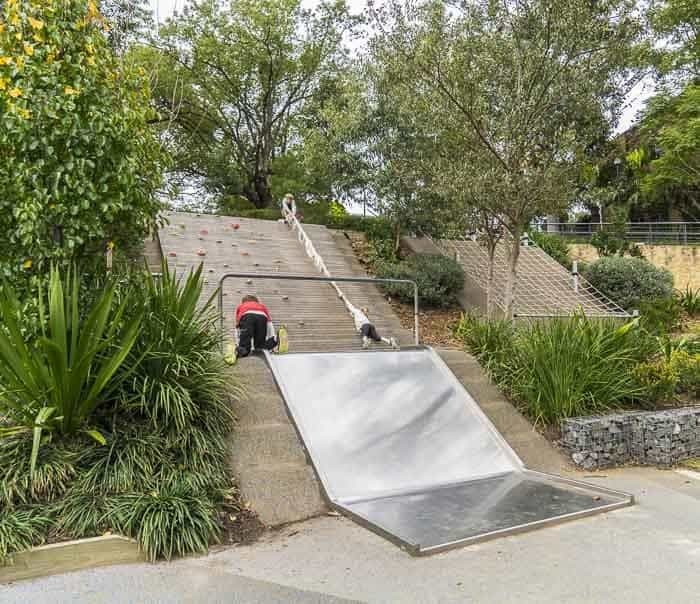 This is a lovely spot and great to include on a family trip to visit Parramatta. Thanks for this Seana – its been on our list for a while but think my two little ones still need some more growing :-). Sadly this will be the last summer you can visit the Parramatta Swimming Pool before it is demolished for the stadium expansion. Boo! I have had some fantastic times at that Swimming Centre, the water slides are terrific. Must go for a last hurrah. Do you know if another swimming centre will be built? NB The Foreshore playground could be really danger our for active little ones and runaways, I could never ever have taken my oldest son there when he was little. But he’s 19 now!! They are still debating where the new swimming pool will be built – http://www.dailytelegraph.com.au/newslocal/parramatta/parramatta-council-to-assess-former-golf-course-site-for-new-aquatic-centre/news-story/52ba1e21b519a16240b2249b2faa6ad9. Hi there, I'm Seana and I'm delighted you have found Hello Sydney Kids. My name? You pronounce it 'Sean-a'. Blame the little Scotty dog I was named after as a baby in Scotland. Read more about myself, my family and this website here. If you purchase an item using these links I may receive a small commission, at no cost to you. This helps support the blog. Hello Sydney Kids is a participant in the Amazon Services LLC Associates Program, an affiliate advertising program designed to provide a means for sites to earn advertising fees by advertising and linking to Amazon.com.au. ... and you’re keen to explore Sydney and far, far beyond, sign up for my email newsletter. You'll find news and offers just for subscribers, and you'll get a copy of my ebook 'Sydney's Best Beaches For Kids.' absolutely free.